Kick off summer at the big annual fine art & craft sale and art-a-palooza! Join 50+ artists and commercial creatives in this historical building as they open their studios to the public in this once-a-year event. Meet working artists, tour spaces, learn techniques, multi-floor building down by Portland’s eastside waterfront. During last years event, we estimated over 1000 people attended during the course of 6 hours. We hope to see all you familiar faces and new ones! This year’s event—started in the 1990’s—will feature work from both established and rising artists: painting (oil, acrylic, watercolor, encaustic and other), photography, glass, design, mixed media, woodwork, ceramics, apparel, printmaking, sculpture, film, installation, architecture, performance and much more. Enjoy live music, food, beverage, door prizes with some surprises on each building floor as well. This is a free and family-friendly event. 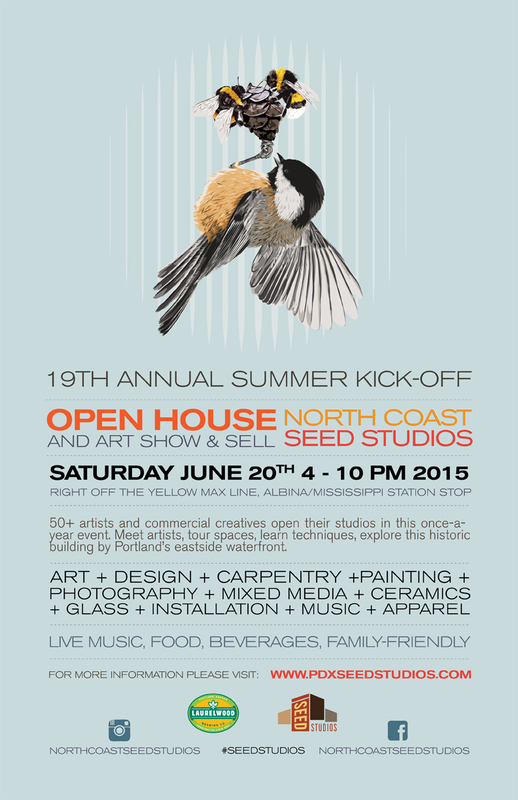 April 29, 2015 | Filed under Events and tagged with North Coast Seed Studios, North Coast Seed Studios Open House, portland art studios, Seed Studios.